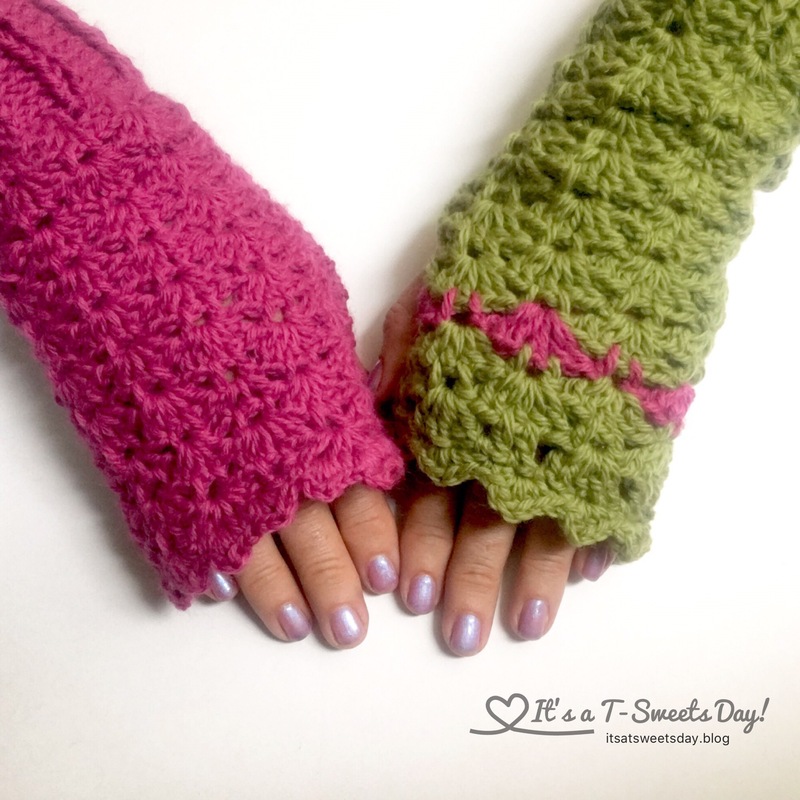 Brenna’s Fingerless Gloves – It's a T-Sweets day! 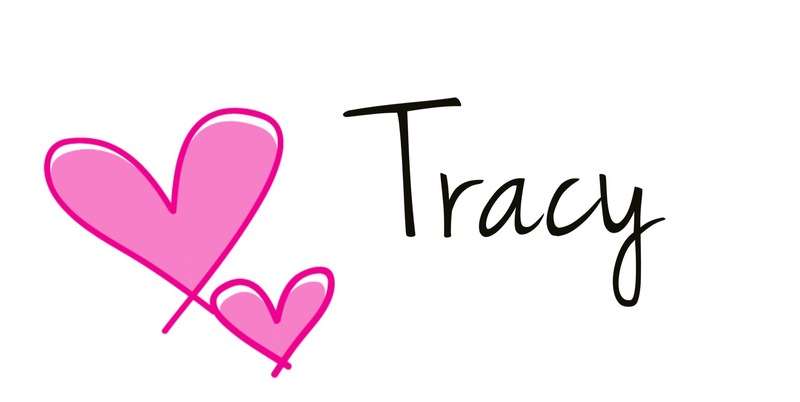 Published on November 4, 2017 by Tracy @ It's a T-Sweets Day! 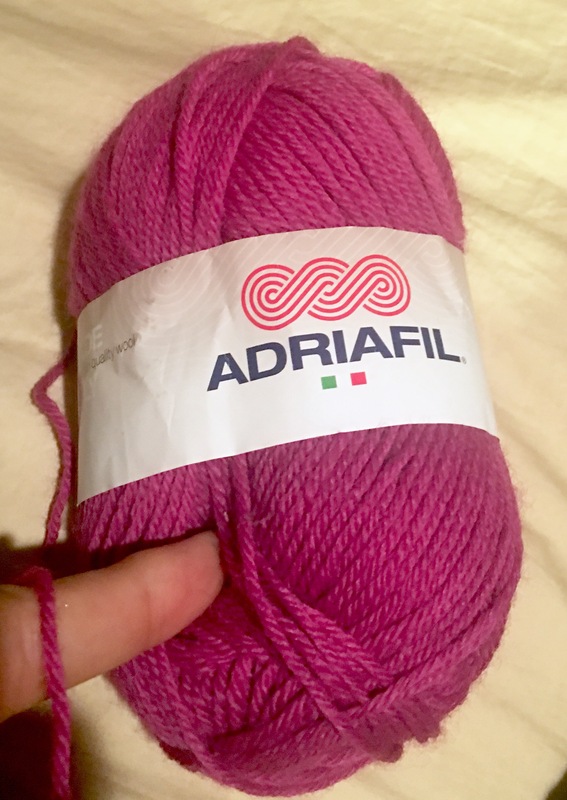 A cute friend of mine went on a trip to France last month and was so SWEET to think of me and bring me back a skein of beautiful pink Adriafil yarn. She is just the best!!! I wish I would have thought to take a lovely picture of the yarn before I started crocheting, but I was already started late at night and remembered to take the picture right where I was. The lighting isn’t perfect, but you get it, right? When she gave me this yarn, I knew exactly what I wanted to make with it. 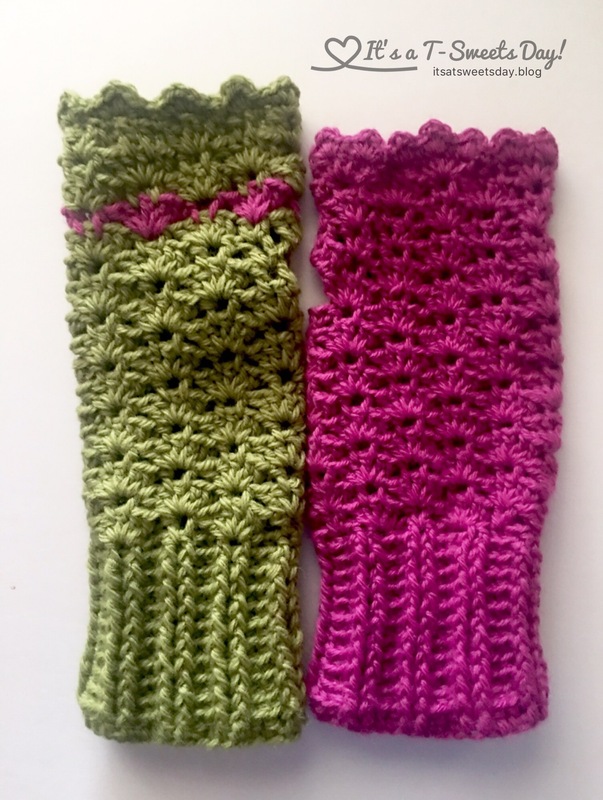 About a month or so ago, Brenna, from Crochet 539, posted that she had designed a pair of fingerless gloves that looked perfect for Arizona cool, but not too cold, mornings. I got out my hook and crocheted away. I only had one or two questions with the instructions, but I managed to crochet up a glove that looked pretty much like Brenna’s. I made a few errors but seemed to be able to fix them as I went. The main problem was that the one small skein of yarn only made up one glove. Oh no! Well, I never let a hitch in the road stop me:). Since I couldn’t just run over to France and buy another skein of yarn, I looked through my stash and found a green that I think made the gloves even better than if they would have been if they were the same color. But pictures can be a bit deceiving. Because I used two different yarns and the weight was different, they are two different sizes! Lol :)! I knew they were different weights when I started so I tried to adjust by decreasing the starting stitches which made the green glove skinnier. I also decreased the number of rounds and tried to compare and measure as I went, but the green still ended up longer. No one is perfect and especially not me! Thank you for a fun pattern Brenna! It is a super SWEET day! Previous I’m Down the Rabbit Hole Again! These are beautiful! I love how you tied the pink and green. I’m glad you like the pattern, let me know what questions you had, I’d love to help! Thanks for the feedback! I will definitely take a look back at the pattern and make some fixes. They look great,so your adjustments worked! These are awesome gloves! I’m sure no one will notice the difference in size when you’re wearing them, unless you point it out. Thank you Kate! I am not much of a “hey look at this mistake” type of person. So I will definitely not be pointing this out much beyond this post. I just thought it was funny and that it was an honest look at my crochet adventure for these past few nights❤️. :). I really do love them! They look great!! Definitely love the different colors! Now that you’re “planning” it, my only suggestion would be to put the contrasting stripe on each mitt. They really are cute! Those turned out cute! I have seen this similar at the top of fashionable boots like a cuff. 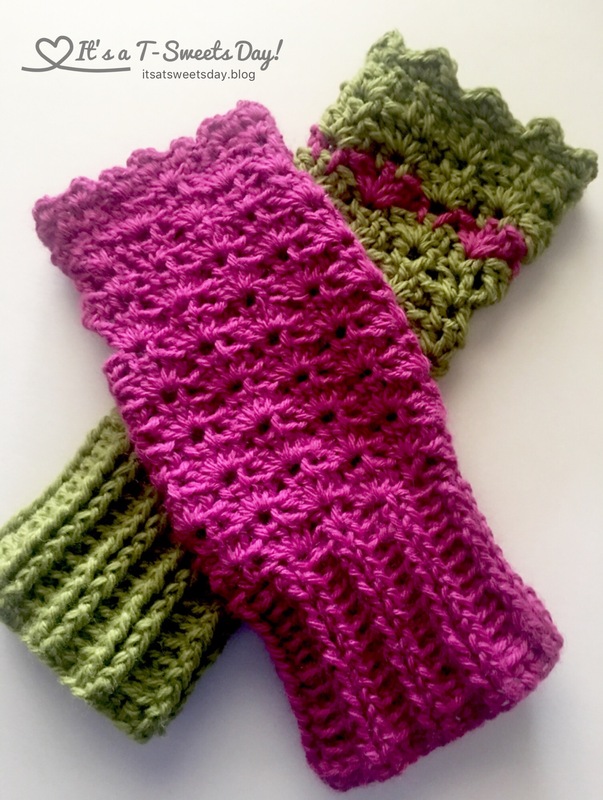 The fingerless gloves are a neat idea for the gifting time of year!